great for carpentry & door hanging. rigid aluminum i-beam construction is rigid and durable. rotating dial vial makes it easier to find the angle you are looking for quickly. 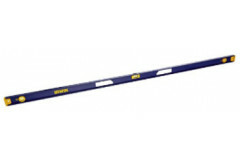 v-groove edge for leveling pipe, making the job easier and quicker.